Are you in a brush-rut? 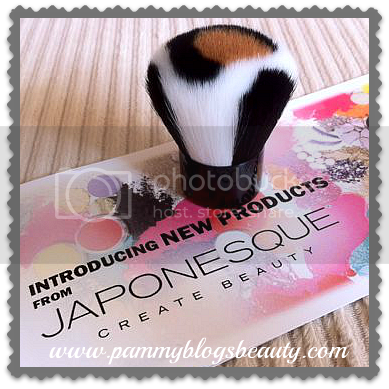 Shake things up with this adorable new collection of Safari Chic animal-print brushes from Japonesque! If you are a fan of leopard print, you will love these cute brushes! Japonesque brushes are just phenomenal! While they are a little bit on the pricey side for an Ulta brand, you get a top quality brush that you can use (and adore!) for years to come. All you need to do is feel the amazing softness of these brushes and you will become a fan for life! I love that the Japonesque brush display at Ulta has brush samples so that you can do just that: feel the brushes! Japonesque has variety! The brand offer 300 styles of makeup accessories: tools, brushes, applicators, palettes, organizers, and cases. 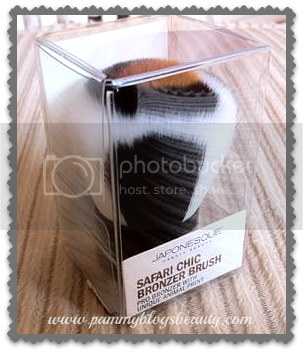 For this review, I tested out the Safari Chic Bronzer Brush. For my review and details about the entire collection, please keep reading after the jump! Flaunt your inner felines with our purr-fect Safari Brush Set, which consists of an uber-plush Powder Brush, Shadow Brush and Crease Brush. A signature microfiber case holds these lust-worthy, leopard print brushes, designed to keep you catwalk-ready while you’re out on the prowl. Retails for $29.95. This super-luxe bronzer brush is paw-sitively splurge-worthy. Roam around with a beautiful, sun-splashed flush. Get your claws into this Summer’s chicest brush. Meow! Retails for $22.00. While the collection features leopard print, know that these are synthetic brushes and animal-friendly! The adorable wrapping *had me at "hello"*! This brush is soooooooo soft! This brush (and Japonesque brushes in general) is one of the softest brushes in my collection. It is certainly my softest kabuki brush by a landslide. You are just going to have to feel it yourself to experience the softness!!! 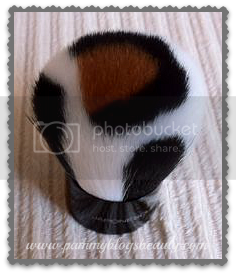 Compared with my other kabukis, this Safari Chic brush is about mid-sized. Given the size, it is best for all-over bronzer application rather than contouring. You can get your "tan" summer glow with this brush plus your favorite bronzer! Hey, it is the only way my face gets "color" since I don't tan my face in the sun. The brush hairs are pretty densely packed. So, the balance of softness and stiffness is just perfect! The hairs have just the right amount of bend. There is such a delicate balance with softness/stiffness/density and Japonesque has really gotten it right with this brush! While this is technically a bronzer brush, I actually like it best for powder foundation application. Typically, I am a powder foundation girl. I just dust on MAC Studio Fix through my t-zone, blend out, and my face is good-to-go foundation wise. 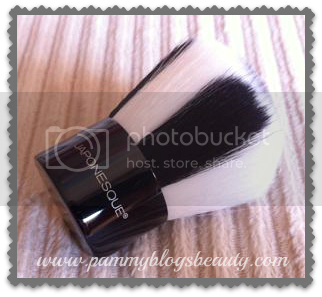 This brush has totally *replaced* my usual kabuki for everyday powder application! I test out a ton of beauty tools. So, it is indeed a special and rare occurrence for me to find a new favorite beauty tool! All other details aside, this brush is just darn stinkin' cute! I can't get over how they created a leopard print with the hairs! It certainly makes this brush stand out in my brush collection. The fun printed hairs make this collection a must have for any brush collector. In addition to the Safari Chic collection, Japonesque has also recently launched a HD Collection of dual-sized (dual fiber) brushes. So, be sure to check those out too! I haven't tested these; but, I am intrigued with the dual-sided brushes! Oh gosh, every post I see on these makes me want them more! !